Hello Everyone, I have read a lot in the forums and have not found a solution so I figured I would make my first post. I am a college student with not a lot of experience so I apologize if I ask for more detail regarding specific directions. I am trying to simulate and compare a few different bike rim designs and find which one would have the strongest wall/design with impacting a curb/steel beam/ ect. I have modeled out the design into a 10" extrusion and have tried doing drop tests on the part with a second "steel impact part" in a drop test but my results are not giving what I am looking for. In the "Impact Test" photo you can see that I did a drop test and had a Displacement of the rim of 1.22mm into the "Steel head". However, when doing other simulations, I don't feel I am getting the results I would expect. I am trying to determine which rim would have the best impact resistance with a beam/curb hitting at 25ft/sec. Is drop test the correct simulation? Or am I way off? Thanks a lot!!! Note: The "BikeRim and Curb" photo was when I tried doing a static impact with two fixed sides. It looks like you're doing this with a linear static analysis (which is arguably the proper way to do this from a trending stand point), which means you could take advtange of some symmetry here! If that extrusion defines your rim cross-section, and would normally be revolved into a wheel, then you can make an axisymmetric model. Using axisymmetry will greatly reduce you model size, allowing much, MUCH quicker run times. I'm not sure if the 2D idealizations are limited to certain SW licenses, but I'm sure someone else here can answer that. Anyawys, you'll need to have a plane defined that captures your cross-section, and an axis that defines the axis that the cross-section is revolved around to create the 3D rim. Hi Shaun, thanks for the Reply. The 10" extrusion I created is just an extruded model of the cross-section that would normally be revolved around a central axis. I did it this way because I was having meshing issues when running a simulation and linear extrusion compliled and ran a lot faster. When you mean axisymmetric model, I am confused to what you are referring to. This is my first time using this simulation software and I don't see that as an option. Is there a specifc way to set this up? Am I able to use two parts impacting into each other? Thanks! Axisymmetric means that your model properties (geometry, loads, and constraints) are symmetric about an axis of revolution. Say you had a rim with a cross-section similar to an I-Beam with a uniform load on the outside surface of the rim, as shown below. Since the unit vector for the load is defined by the radial direction and the geometry and load are constant as you rotate around the rim, you can model this using 2D axisymmetry. The model would look like that below. You might notice that since this geometry (and load) are symmetric about the horizontal axis, another symmetry idealization can be applied. You'll also notice in the above image that I've applied a symmetric constraint on the edge created by the last cut. 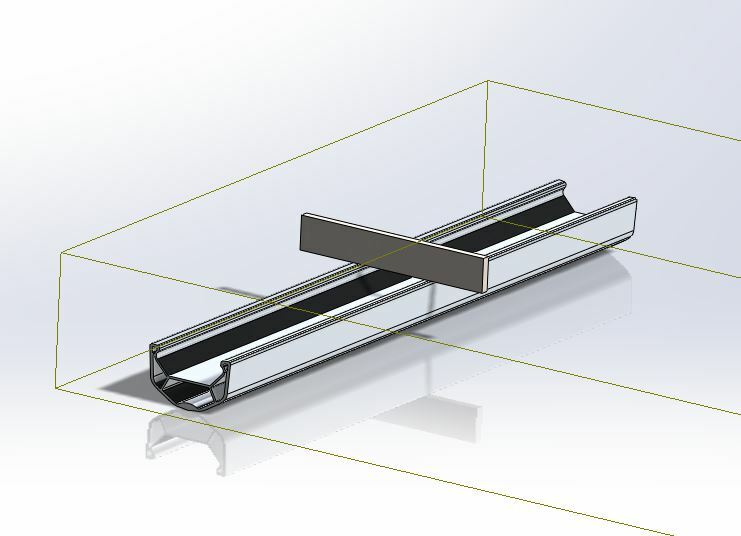 This constraint allows the bottom edge to slide horizontally, but prevents movement in the vertical direction. Now, you've probably realized that this modeling scenario does not represent what you're trying to model (an impact with a curb). Realistically, this model represents the load a tire would apply to the rim if you had to stretch the tire to get it onto the rim. So why model this case? While this scenario doesn't represent what you're after, it does allow you to get some valuable trend data on how different cross-section compare against one another. You can use this trend data to eliminate some of the weaker designs before moving onto the more realistic analysis cases. The advantage of this is that an axisymmetric model will run a lot quicker than an impact analysis or transient analysis. Once you eliminated some of the designs and are left with a smaller sub-set, you can then move onto a 3D impact analysis (also called a drop test). I don't know if SW allows you to do an drop test against another part with a defined geometry; if it doesn't, then you'd need to do a nonlinear analysis (time dependent with contact). Thanks for the reply and the figures Shaun that really helps. I will play with this simulation a bit and get back to you. I do not have Solidworks in front of me at this time. Am I to assume that this 2D can be applied to specific walls on the rim? 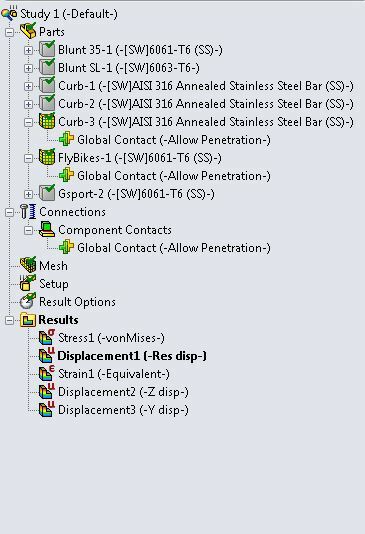 Also is this a simulation under solidworks where I would select a Study then Static, Buckling, Droptest ect. When you have the analysis menu open (static, buckling, etc), there should be a check box with 2D Simplifcations. linear static > like shaun said, good for general trends of one vs another. but look at the name, linear material, static analysis. 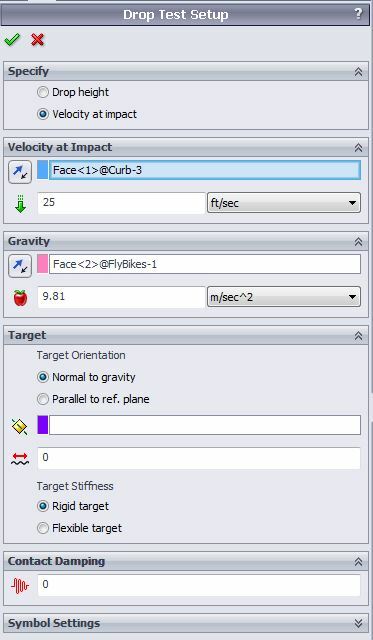 drop test > take into account some of the time effects, but this is only for velocity at impact or from a height. this might work for your needs if you assume the curb is rigid. nonlinear static > large displacements and nonlinear material will be better taken into account here. nonlinear dynamic > grand daddy of them all. run parts into each other. take into account time. take into account damping. Hi Jared, thanks for the reply as well. I would like to do a nonlinear dynamic as I want to be able to simulate 2 parts running into each other and the result of the mike rim impacting a surface. As for problem definition let me go into more detail of what I would like and possible you can help me through the best solution. What will be your full model? My full model I am find with running just a 10" extruion impacting an odd surface such as the curb/pipe shown in my OP (original post). Unless my data will really change from running 10" extrusions of different bike rims compared to a full wheel. What I am looking for is to compare to compare 4 different types of bike rims to each other and which one is the most impact resistance for hitting a curve for example. Figure 1: Four 10" bike extrusion cross sections. I have already ran linear and radial tests to determine strength of the rim. But would like to see how they would handle impact. So, what ever rim has the best impact resistance being hit from a defined part? What assumptions you're ok with? To be honest, I don't know what to put here. I want to assume that wall thickness of certain rims will have a larger impact resistance and that the surface area of the initial impact will be the most important. However, I think these Solidworks Simulations can go into more detail and what my displacment of an object impacting a rim would be. I would like to be able to run the same simulation for each rim impacting, or being impacted by another part and determine how much displacement the rim had and if it was more impact resistant than other rims. Thanks again for reading all this and I hope I made it clear. or that you can attribute the behavior of the full model to the same that you would see with just a section like you've shown in your screenshot. or with a static analysis that you assume there is no time dependency. if you're going with that method, a 2d analysis might work but you have to think about what that means (like shaun described) from a loading perspective. of course you can put the split lines anywhere you choose by puting it on an angled plane the split line will project straight from that plane this is just an example. the "noodle" has to intersect the model this just keeps it from flying around when you apply the force. id give a demonstration but i dont have access to fea at the moment. Hello Raul, I have not tried this idea. I will try split lines. Is this something in the simulation where I am able to determine the impact results? I wanted to give a summary/re overview of where I am at on this simulation. I think a few of replys still think I am going for the results of a force being applied. What I want to determine is the impact of an object. Or is there not a difference? If I was to take a pipe and hit a piece of wood at 25ft/sec compared to pressing on it the results would be different. 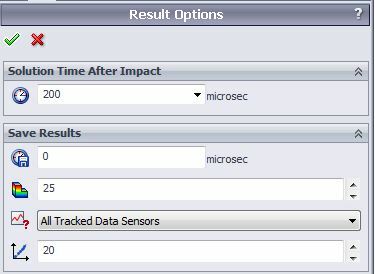 I ran through a few drop test simulations and I will show how I got this and the set up I took. Figure 1: 10" Rim section with "Impact part" mated to the top of the rim. Here is my Study 1: Drop Test main tree. The Parts in gray I have Excluded from the Anaylsis. From the simulation this was an image of the results. I assume the the impact part was displaced 1.524 mm into the Rim itself? I have also made a gif of the Animation. It looks like the Rim and impact part both fall together and hit the ground surface. Is this the same as if the rim was on the ground and the impact part impacted at 25f/sec? your drop test is simulating the wheel section dropping onto an infinitely rigid ground with something dropping on top of it. the reason we're suggesting a force is that it simplfies the problem. it is "similar" to the impact and you don't have to mesh the part that is coming in contact with it and also you don't have to deal with the collision analysis. you don't really care about the collision, you care about the effect on the wheel, so you're spending computational time where it is important. if you do this with a static analysis, you have to think abotu the assumptions. the big one is that time isn't a factor. that isn't true in impact so you'd have to add a multiplier to the force. or you could move to linear or nonlinear dynamic and take that into account. is this for a thesis/senior project? Force is force reguardless of impact or consistant pressure. if you know the surface area of which the object is going to impact the rim then just use a few math calc's to find out how many lbs of force is being applied to the rim from the impact of the curb, and apply that force to the area of impact of the rim. Why i suggested the model with split lines and the noodle it gives you the true form of the bike rim, and it also allows no restraints so it will give you the best result for what will happen to the rim if you were to hit a curb X big and say from the collision you applied X force to the rim. What Raul says is often true, that you can use a static analysis to understand what is happening in an impact situation. It is not always true though. Many materials behave differently depending on the strain rate.